Chariot Race was a superb game which came out towards the end of the Vic 20’s short life around 1984 time and was written by Paul Hope who distributed the game from his living room with the help of his children and wife. It was number 1 for a period of time, and is very fondly remembered. Sadly however, Paul passed away in 2011 – but luckily a tribute towards his game was made which he managed to have read to him before his passing, so he knew just what everyone felt about his work. 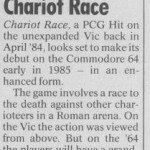 Shortly after the published article in Retro Gamer on the Vic 20 version, I came across a mention of a C64 version of Chariot Race being put into production. It seems that due to the success of the game that Paul had originally considered doing a C64 update of the game to take advantage of the hardware. However, from the article we know that Paul went onto other unreleated ventures instead of progressing onto later platforms. So was anything ever started of the C64 version of Chariot Race?…. We hope to confirm sometime in the future, as the Hope family did have a C64 afterwards and it could be possible that Paul once made a start.